Rose sized Paisley Flourish plastic gift bags are made from 3 mil frosted clear plastic and feature a bold black paisley design. Bags measure 5.25x3.25x8.5" and are sold in a bulk carton of 100. 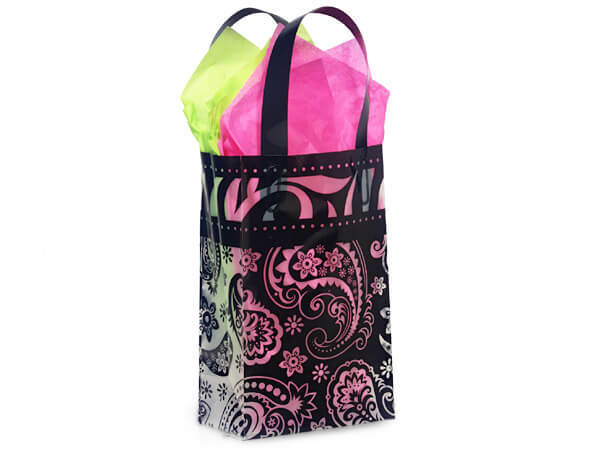 Our Paisley Flourish Plastic Gift Bags have a bold black paisley design on frosted plastic. The gussets feature a clear paisley over a black background. Bags are 3 mil hi-density polyethylene with matching black soft loop handles and cardboard insert bottoms for stability. Bags are individually UPC coded for resale.